Final T&F Signing Period: Where Are Florida Athletes Headed? The final signing period for high school athletes is this week. Track and field and cross country standouts from across the state are finalizing their decisions on where they will spend the next four years. So where is everyone headed? Check out our list! Don't see your name? Send an email to Todd.Grasley@flosports.tv and we'll get you on there. Coach Bob Braman and the Seminoles signed several of Florida's best. Asia McMillon- The American Plantation HS hurdler is moving to North Florida to reside in Tallahassee as she has signed to be a Seminole. McMillon is a dangerous hurdler who holds a PB of 14.55 in the 100 hurdles and a PB of 43.29 in the 300 hurdles. Milton Ingraham- The Hallandale thrower will join Coach Dorian Scott's squad that consistently produces national qualifiers and All-Americans. Ingraham, who ranks in the top ten in the US in shot put and discus, will be coming in just in time as former Gulf Breeze thrower, Austin Droogsma finishes off his career as a Seminole. Clayton Carlson- One of the best middle distance athletes to ever run for Lincoln HS, Carlson will be staying in his own backyard to run for Coach Braman and the Seminoles. Clayton has led his Trojans to a nation best in the 4x800 and has personal bests of 4:17.88 and 1:54.01. Lake Wales senior Paul Stafford makes it official and signs with the Noles. Deshay Fernandes- The distance star from Christopher Columbus HS is taking his talents to Gainesville to join the Gators and run under Chris Solinsky. Fernandez has a wide range of distance as he is a 1:53.94 half-miler and holds a personal best 5K time with a 15:43.99. Trevor Foley- The junior Team USA distance runner is staying in state, where he will continue his running career. Foley is the reigning 2017 1A XC State Champion and holds a personal best of 9:12.66 in the 3200 and 15:20.00 for the 5K. Foley will join a team of successful FL high school stars. Grace Blair- Not many athletes leave high school with six individual state titles, but Grace Blair is one of the few. The dynamic distance star will be staying in the same city where she has been mighty successful, but she will be trading the maroon and white out for some orange and blue. Braddock sprint Jason Reese joins Shaun Shivers and Anthony Schwartz at Auburn. Michael Phillips of Chiles makes his Syracuse University commitment official. Wharton mid-distance runner Dennarius Murphy signs with Palm Beach Atlantic. Indian Rock Christian's Cooper LaBrant will also be going there as well. Timber Creek pole vaulter Austin Thompson pledges to UNF. Pole Vaulter Stone Baker of River Ridge will stay close to home and compete for USF. 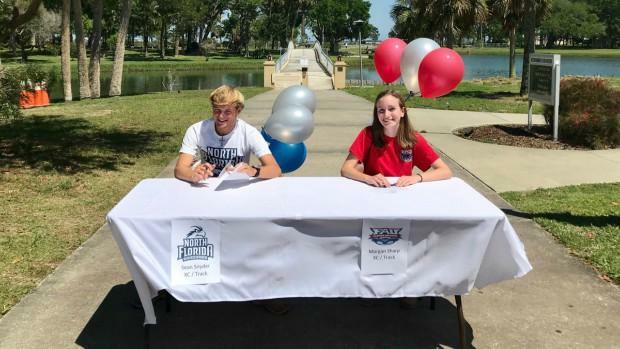 St. Joseph's Academy seniors Sean Snyder and Morgan Sharp (pictured above) are headed to UNF and FAU respectively. Lake Minneola distance runner Noah Quintana lands at St. Leo University. Jayden Horne of Niceville has signed with Lynn University. Alexandra Perri of Citrus Park Christian has signed with Stetson. Arielle Boone of Sunlake is heading to USF. Jared Hayes of West Shore HS will be running at UNF. High jumper Kaley Petrosky of Middleburg is also headed to UNF. Sanford Seminole sprinter Nicole Smith has signed with Jacksonville University. Lake Nona's Roberto Castro will call UNC Asheville home for the next four years. Myles Schreck of Trinity Prep picks Dartmouth for the hammer/weight throw. The King's Academy senior Justin Bridgewater selects Lynn University. Jamal Walton makes his decision Monday. Finalists include Miami, Texas, Oregon, Texas A&M, LSU, Florida, Arizona State, and USC.